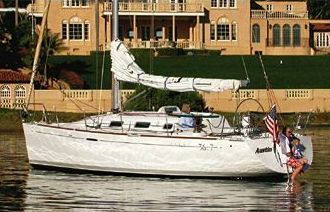 This First 36 sailing charter yacht is based in Brittany, France. 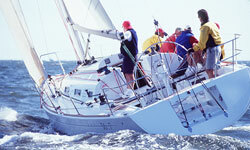 The BENETEAU FIRST 36.7 WAS AWARDED 2002 BOAT OF THE YEAR by Sailing World Magazine. 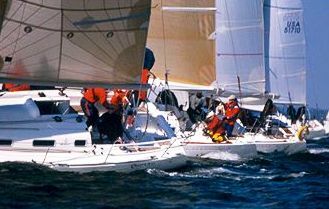 The First 36.7 as designed by the global leader in racing yachts, Bruce Farr and his team at Farr Yacht Design, Ltd., New Zealand. The 36.7 was inspired by the world wide success of her big sister, the First 40.7, the most successful and prolific performance yacht of her size in the last 20 years. The Sailing World Judges awarded the BOTY- Best Value to the Beneteau First 36.7 based on her incomparable value, impeccable design, sailing performance and comfort. The First 36.7 comes well equipped for her price tag, with standards such as rod rigging, sail drive diesel, top-of-the-line Harken and Lewmar hardware and Edson CDI steering. Judges were especially impressed with the spacious cockpit layout with removable lockers, innovative removable salon table, and luxurious comfort below. The First 36.7 handles well in “Wind conditions constantly above 20 knots gusting to over 35 knots and the waves were a steep chop. By playing the main traveler and sheet we were able to keep the boat sailing at over 6.5 knots, and were able to outpoint any boat in our class beating a J-120, X –119 and Mumm 30. 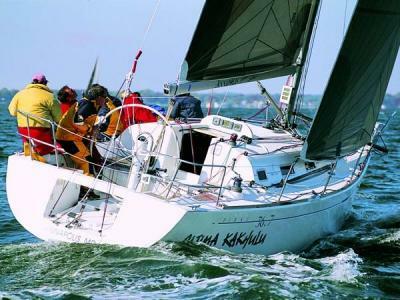 After the race, we had many a crew coming to our dock to have a look at this little Beneteau that had gone upwind so fast,” skipper Garth Hichens remarked. “Under way the First 36.7 springs to life. Upwind the helm feels balanced and the boat has an overall powerful, smooth feel. 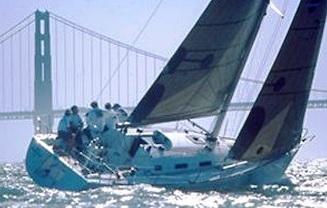 She was responsive to sail trim and rudder movements both reaching and running downwind. With little effort this boat will break loose and surf under spinnaker in the open ocean,” BOTY Judges commented. “If you want to get a lot of bang for your buck, then the 36.7 is hands down your best bet. 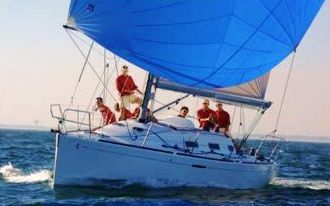 With a starting price of $107,400 including basic electronics but less sails and spinnaker gear, this will be a hard value to beat, racing or cruising. It’s obvious that this boat carefully addresses the needs of buyers who want to be able to race competitively at the one-design level yet still cruise in comfort,” wrote Lynn Bowser, Sailing World Magazine. Character, style, performance and all the equipment of a true 36’ racer, plus easy live-aboard comfort… pure sensations ; all the Farr Yacht Design touches of the First 40.7, the 40’ world-class champion.Both versions share the same interior, effective deck plan, large ergonomic cockpit perfect for genoa trimmers, mainsheet-trim position tucked behind the helm and a deep lead keel... 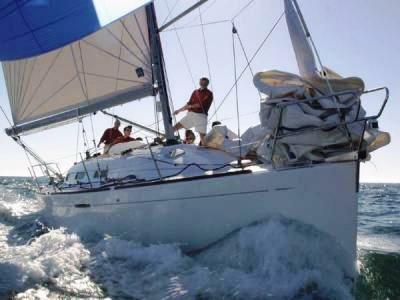 This Brittany based First 36 is truely a stunning performer, designed for those who love sailing. 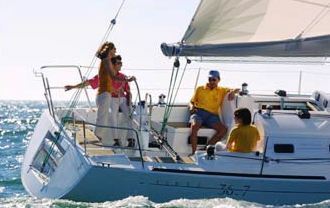 The Brittany Beneteau First 36.7 accommodates 6 (3 couples) in 3 double cabins.